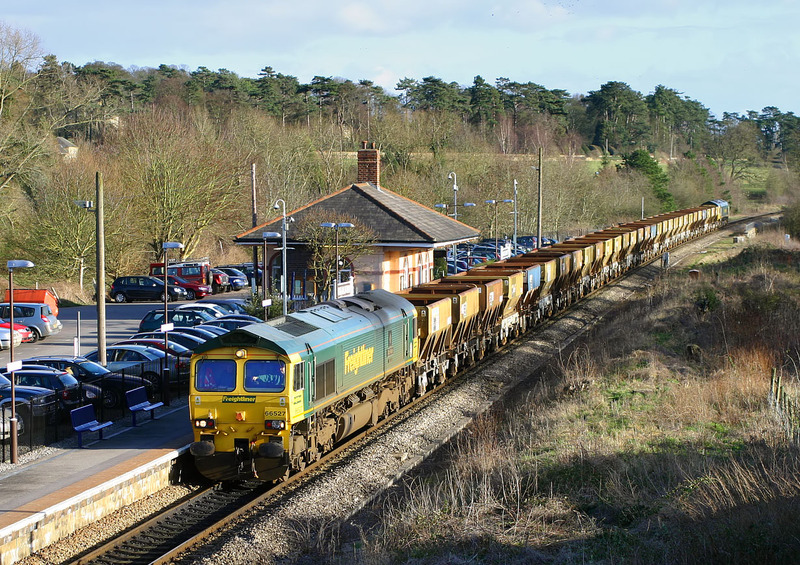 No sooner had I added the picture of 37276 to this website, with a caption explaining how there had been no freight on the southern end of the Cotswold Line for many years, when this happens! 66527 Don Raider and 66507 worked the 6Z49 10:51 Neasden to Long Marston on 1 March 2007 conveying a rake of PGA hopper wagons formerly used on the Wool to Neasden sand trains for storage at Long Marston. Normally such trains would be routed the long way round via Swindon and Worcester. The use of top'n'tail locos was necessary because the run-round loop at Honeybourne is out of use due to the state of the track. Remarkably I was the only person to witness this most unusual working passing through the Brunel designed station at Charlbury in a very lucky patch of sun.